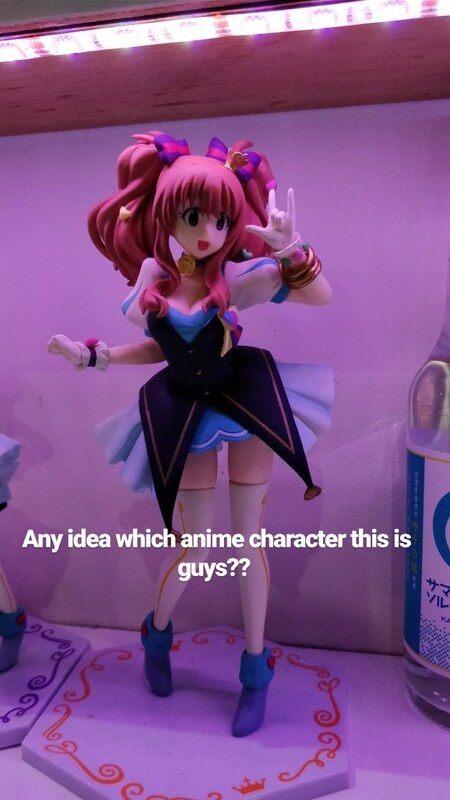 I had come across this action figure when I was Japan, but was unable to find the character name. Please help me out and if possible, give a description of the characters. 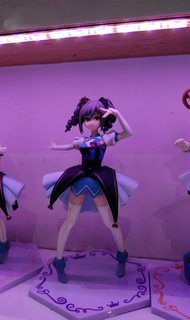 These are characters from the gacha mobile rhythm game THE iDOLM@STER CINDERELLA GIRLS, a rhythm game spin-off of THE iDOLM@STER franchise. Unlike its counterpart THE iDOLM@STER: Million Live!, it features a completely original idol line-up, with the original characters of the franchise only making guest appearances in events. The game also got an anime adaptation that ran for 2 seasons, the characters shown here were part of the ensemble of 14 idols selected to star in the adaptation, these 14 characters were shown in the adaptation as girls that were scouted for the Cinderella Project ran by the Producer. Other idols in the game also make an appearance as already established idols, making them all senior to the 14 newbies. The figures you shared depict Moroboshi Kirara, Kanzaki Ranko and Mimura Kanako in the outfit they used for the Opening Theme for the 1st season of the anime. 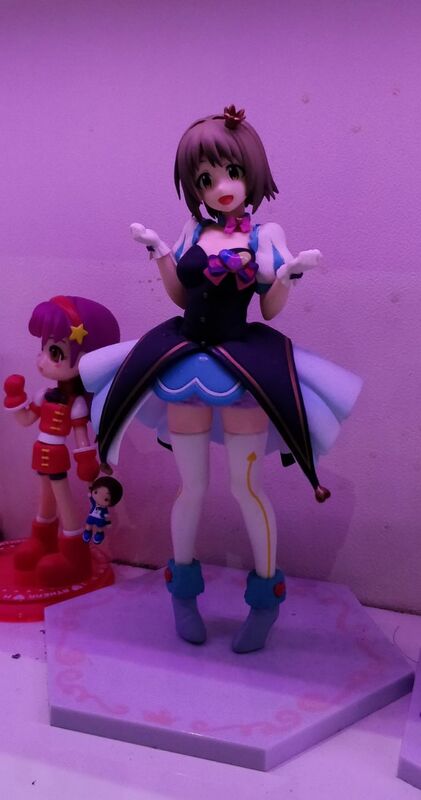 This outfit was used as well for the final concert shown at the end of the 2nd Season. Moroboshi Kirara is a tall girl with a deep love for cutesy things, which goes to show in her burikko-like speech patterns. She does have a complex about her height being a mismatch with her personality but she's really optimistic as well which tends to hold back her complex. 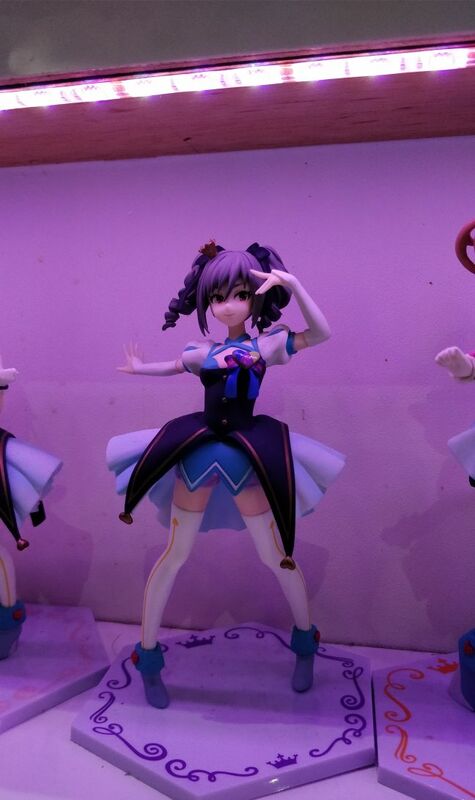 Kanzaki Ranko, the fallen angel, a chuunibyou-style idol. She has trouble being honest which is why she hides behind her "fallen angel" persona, down to her everyday speech. Incidentally, she's no good with horror. Mimura Kanako, a slightly chubby girl who loves sweets. She keeps worrying about her diet, but can't seem to be able to stick to them. A happy-go-lucky cinnamon roll.